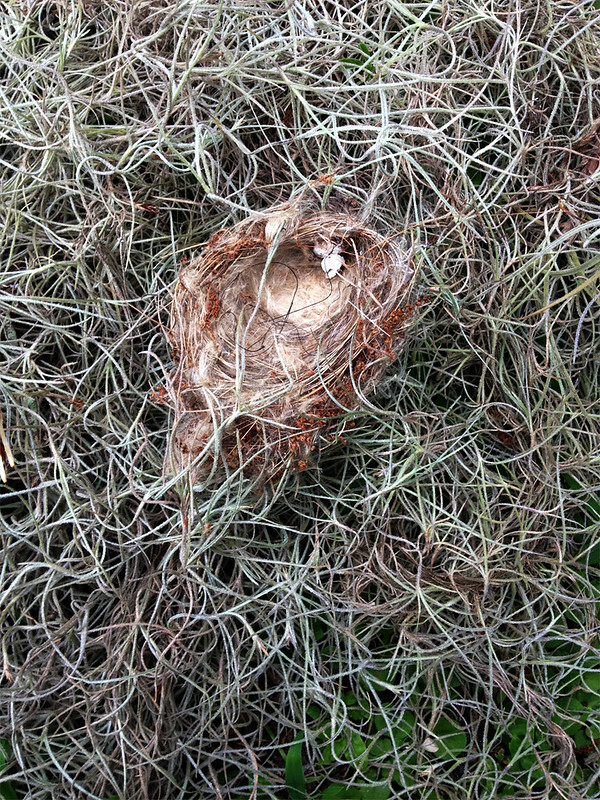 Last month, Arthur found a very small nest in a tangle of fallen Spanish moss on the ground in our back yard. I took a couple of photos, hoping I would be able to identify the nest-builder. That’s my (fat but not freakishly large) index finger for scale. We don’t have a large number of small-sized breeding birds here in our yard, so my list of potential species was quite small. Tufted Titmice are abundant in our yard all year, but they are cavity nesters. We have Blue-gray Gnatcatchers in our yard all year too, but they make a deep cup-like nest attached to a branch. 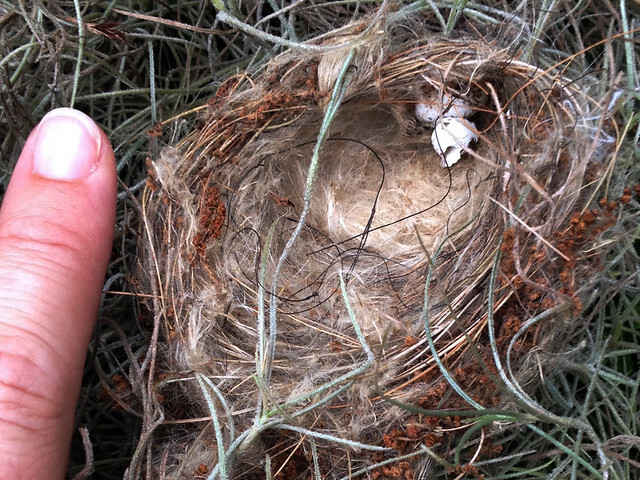 We have Ruby-throated Hummingbirds here year-round, too, but this nest is way too big for those tiny dynamos (besides the shape and material mismatch). My last guess turned out to be a good one, I think. We have Northern Parulas singing in our yard all spring long. All About Birds tells me that Northern Parula “nests are usually in a hanging clump of epiphytes like Spanish moss, beard moss, or lace lichen. That seems like a good match to me. 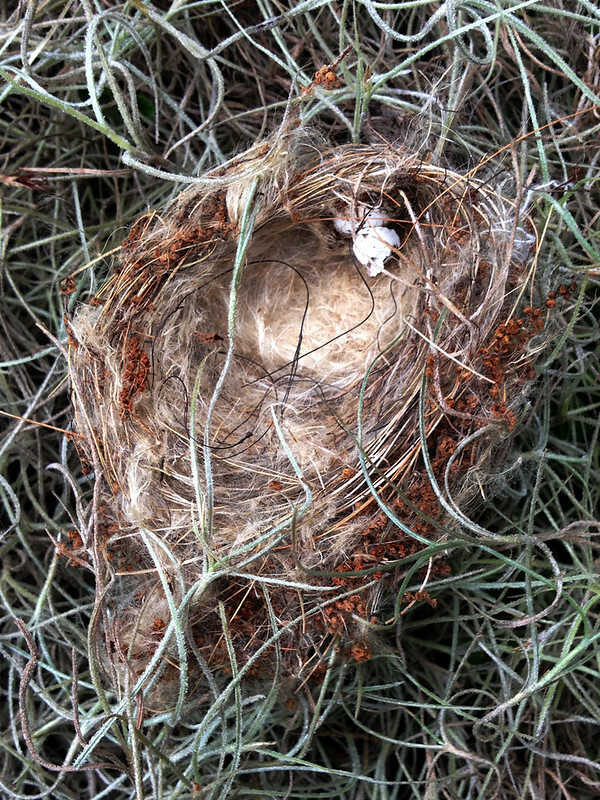 Arthur spotted the nest on June 23rd, and it probably fell that day or a day or two earlier. This is on the tail end of the nestling (April 7 to June 29) and fledgling (April 18 to July 4) stage for this species in Florida. There were a couple of broken eggshells in the nest when it fell. Hopefully the babies safely fledged before the nest was lost. This entry was posted in Florida, Yard Birds. Bookmark the permalink. Amy- my ebook “The man who saw too many goshawks” is available from http://www.smashwords.com. The best – Nelson.